When we think of the Gold Coast, we immediately think of the vibrant skyline and lively nightlife, but the truth is, there is so much more to the Gold Coast. The Gold Coast is home to 72 km of pristine beaches and surf breaks, perfect climate, lush hinterland and rainforests, waterfalls and hiking trails. Not to mention the amazing cafes and restaurants, large selections of adventure activities and world-class shopping. 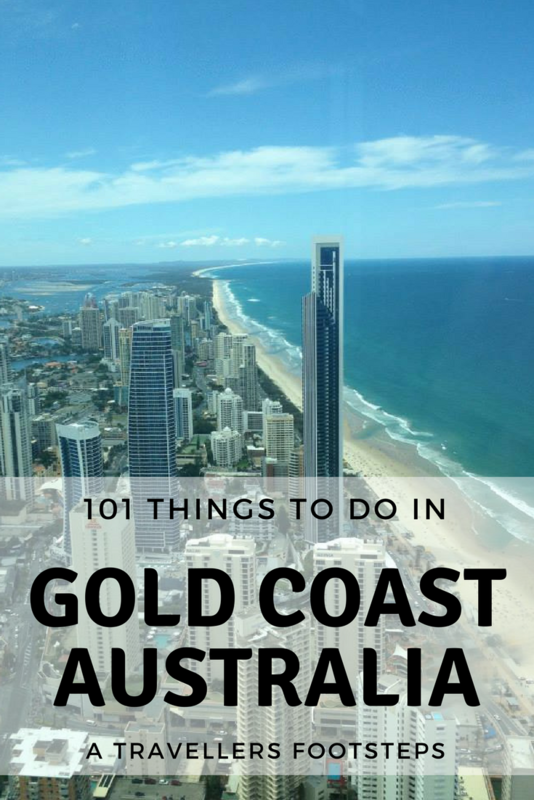 There is something for everyone on the Gold Coast, and I am here to prove it to you with this guide on 101 Things to do in Gold Coast. The 101 Things to do will be broken into things to do in the gold coast hinterland, free things to do in the Gold Coast. adventure activities, things to do in the south of Gold Coast and things to do in the north of the Gold Coast. 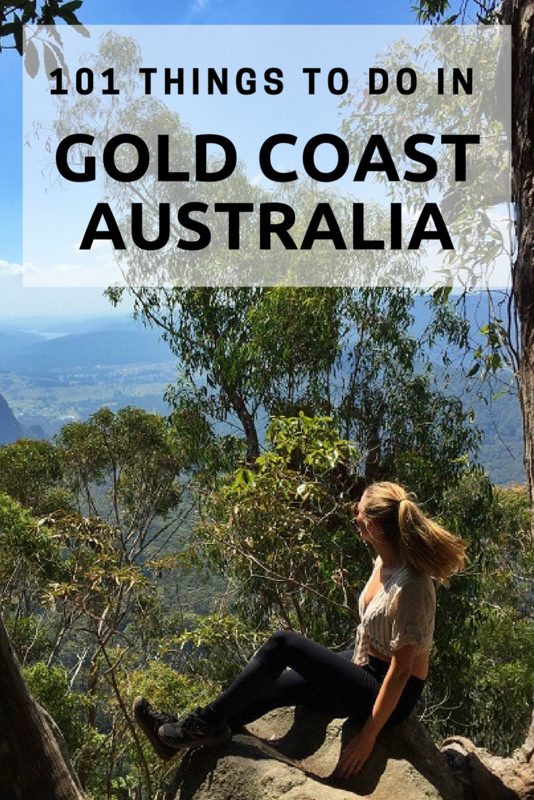 Because I spend most of my time in the Gold Coast hinterland, this is where I will start the guide on things to do on the Gold Coast. But if you’re more into beach or adventure activities, don’t worry, I have something for you too, just keep reading. 1. Hike to Purlingbrook falls in Springbrook, one of the most impressive waterfalls on the Gold Coast. 5. Indulge in a winery tour at Mount Tamborine. You can book Taste Of Tamborine Brewery tours leaving from the Gold Coast here. 6. 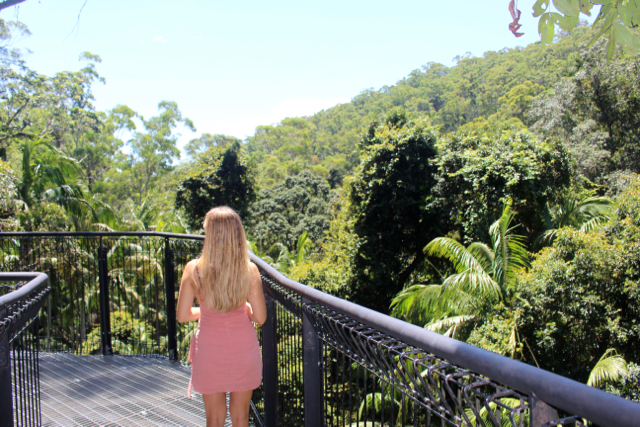 Take a walk above the treetops at Mount Tamborine Skywalk. This is my guide to visiting. 7. Visit the Natural Arch in Springbrook at night to admire the glow worms. This is my complete guide to visiting the Natural Arch. 8. Visit Curtis Falls, Mount Tamborine – one of the best Gold Coast waterfalls. 11. Day trip or spend a night at Binna Burra, located within Lamington National Park. 12. Swim at Lip Falls – Beechmont, a locals secret waterfall (not anymore). 13. Visit O’Reilly’s Green Mountain. Book a tour here. See the best Gold Coast hiking trails. 14. Enjoy a long beach walk – the Gold Coast certainly has no shortage of long stretches of beach. One of my favourite things to do on the Gold Coast is to take a long beach walk at sunrise or sunset. 15. Hire a bike and ride along the beachfront – The Gold Coast is a cycling friendly city, so make the most of it. 16. Swim in the ocean – the beaches are some of the best in the world. Make sure you swim between the flags. 17. Relax on one of the Gold Coasts Best Beaches. There is no shortage of Gold Coast beaches to choose from. 18. Visit Gold Coasts Lookouts. There are lots of places to enjoy the views of the Gold Coast. These are the best lookouts. 20. Hot Air Ballooning over the Gold Coast – check out this review. 21. Visit one of the theme parks: Movie World, Sea World, Dreamworld or Wet N Wild. Wet N Wild is my personal favourite. Get your tickets to the theme parks here. 23. Take a jet boating tour around the Broadwater. Get your tickets for Jet boating here. 25. Go whale watching. This tour guarantees you will see whales or you get your money back. 26. Skydive over the Southern Gold Coast or Byron Bay, if you dare? Book your skydiving tour here. 33. BBQ at Kirra Lookout, the facilities are perfect. 38. Kayak at Tallebudgera Creek, one of the most pristine waterways on the Gold Coast. 39. Jump off the Tallebudgera Bridge – this one if for the thrill seekers. 44. Get photos from North Burleigh Headland, one of the Gold Coasts best lookouts. 47. Take a dip in the Currumbin rock pools, one of the Gold Coast’s best waterfalls. 48. Cuddle a Koala at Currumbin Wildlife Sanctuary. Get your tickets to Currumbin Wildlife Sanctuary here. 49. Feed the rainbow lorikeets at Currumbin Wildlife Sanctuary, for FREE. See more free things to do on the Gold Coast. 50. Head to Cooly rocks on, Australia’s largest 50’s & 60’s Nostalgia Festival held annually in Coolangatta celebrating Classic Cars, Rock ‘N Roll, Dancing, Surfing and more! Cooly Rocks is a free event and open to all ages and is held around June each year. 51. Day trip to Byron Bay – Famous for its beautiful beaches, surf and vibrant atmosphere. Byron Bay is just 1 hour South of the Gold Coast, making for a great day trip. 52. The beaches in Northen NSW are some of the best in the world. Expect long stretches of white sand beaches with hardly anyone in sight. Fingal, Dreamtime, and Kingscliff are all great beaches to explore from the Gold Coast. 53. Hike Mount Warning – the highest point in the region and the first place that sees’s the sunrise. 54. Day trip to Minyon Falls, one of the most impressive waterfalls in Australia. 55. Enjoy breakfast at Cardamon Pod Brickworks – an amazing vegetarian and vegan restaurant. 56. Shop at Pacific Fair in Broadbeach – newly renovated and home to world-class shopping. 58. 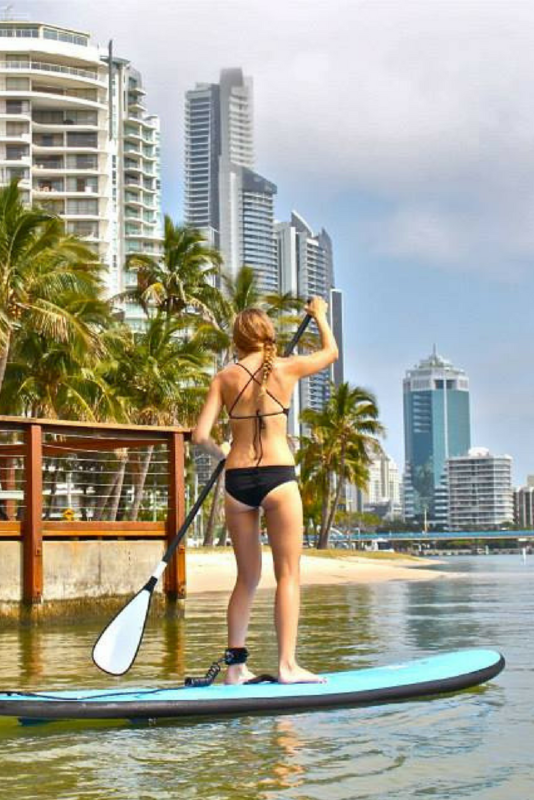 Stand Up Paddle Board at Budds Beach in Surfers Paradise. 60. Explore Coombabah Parklands – a broadwalk set over a river and mangrove forest. Not my 1 thing to do on the Gold Coast, but something to consider doing if you have plenty of time. 61. Shop for bargains at Harbour Town Shopping Centre – the Gold Coasts largest DFO outlet centre. 62. Enjoy a night out in Surfers Paradise or Broadbeach. The Gold Coast is famous for its nightlife after all. 65. Overindulge at the buffet breakfast at Sheraton Mirage. It isn’t cheap, but it’s worth it. This comprehensive list of things to do in Gold Coast should keep you busy for months. Disclosure: This post on things to do in Gold Coast contains affiliate links. Lots of things to do! We are heading this way in April. Can you get to Springbrook and see everything within a day from Brisbane? Oh I do love a weekend in the Gold Coast, I lived in Sydney for a few years and always had a great time in GC. Lots to do! This is probably one of the most thorough lists we’ve ever read! Everything also sounds so fun, i’ve no idea how you’d choose where to begin! I love the Gold Coast and would love to go back one day. After reading all your tips what to do, I definitely will be going back! This is such a great list of things to do! Love all of your pictures! Great post! This has come as good timing for me as I’ll be heading there soon. You’ve given me lots of ideas, thanks for sharing! Wow, what an awesome list! I’m visiting next summer and I really want to climb up the building! You’ve give me lots more ideas now!